Turkewicz-Lukianowicz, Stefanie [Стефанія Туркевич-Лукіянович], née Turkewicz – composer, music teacher; born on 25 April 1898 in Lviv (Ukraine; at that time – Austrian crown land of Galicia); died on 8 April 1977 in Cambridge, England, United Kingdom; buried in St Mark’s Burial Ground, Cambridge. Married Robert Lisowskyj (first marriage), Narcyz Lukianowicz (second marriage). Stefanie Turkewicz-Lukianowicz attended a private girls’ gymnasium secondary school run by the Sisters of the Order of Saint Basil in Lviv. She studied the piano, initially at home, then at the Lysenko Higher Institute of Music (LHIM) in Lviv, and, in 1914-1916, in Vienna. She subsequently studied philosophy, pedagogy and music at the University of Lviv, taught music in a teacher training college in Lviv (1919-1920), studied at the conservatory of the Polish Music Society in Lviv (1921) and gave private music lessons. In 1919 she wrote her first composition, a setting of the Divine Liturgy, which was performed a number of times in St. George’s Cathedral, Lviv. In 1921 she returned to Vienna where she studied at the University, graduating in 1923 with a teaching qualification. She also continued her studies in piano and music theory at the Vienna Academy of Music and Performing Arts. After returning to Lviv, in 1927 she left for Berlin where she studied composition at the Music Academy until 1929, when she moved to Prague. While studying composition at the Prague Conservatory, she also wrote a dissertation on Ukrainian folklore in Russian opera, leading to a doctoral degree which was awarded by the Ukrainian Free University in 1934. Returning to Lviv, from 1934 to the outbreak of the Second World War she worked as a lecturer in music theory and piano, initially at the Szymanowski Conservatory and subsequently at the LHIM. She also became a member of the Union of Ukrainian Professional Musicians. In the autumn of 1939, after the Soviet occupation of Western Ukraine, she worked briefly as a répétitrice and accompanist at the Lviv Opera, then, in 1940-1941, as a reader (docent) at the Lviv State Conservatory (established at the end of 1939 through the merger of the LHIM and two pre-war Polish conservatories). She became a member of the Union of Soviet Composers of Ukraine (now the National Union of Composers of Ukraine). After the 1941 occupation by Germany and the closure of the Conservatory she continued to lecture at the State School of Music (established at the beginning of 1942 in the premises of the former LHIM). In the spring of 1944 she left Lviv for Vienna with her family. In 1946 the family moved to southern Austria and from there to Italy, where her husband, Narcyz Lukianowicz, worked as a doctor with the Polish II Corps under British command. 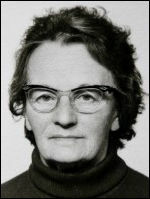 In the autumn of 1946, together with the Corps, she was transferred to the United Kingdom, where she lived in Brighton (1947-1951), London (1951-1952), Barrow Gurney near Bristol (1952-1962), Belfast, Northern Ireland (1962-1973) and Cambridge (from 1973). In the late 1940s she resumed her work as a composer, and between then and the end of her life she wrote the majority of her works. She occasionally performed as a pianist, including in a 1957 series of concerts in various English cities with large Ukrainian communities (together with the opera singer Oleh Nyzhankivsky and the violinist Aristide Wirsta), and in a 1959 concert of piano music in Bristol. She was a member of the Society of Women Musicians (which existed until 1972). Her works include seven symphonic works – Symphony No. 1 (1937), Symphony No. 2 (1952), Sinfonietta (1956), Maliarska symfoniia symphonic sketches (Painter’s Symphony; 1962, 1975), La Vita symphonic poem (1964-1965), Space Symphony (1972), Double Strings (1976); six ballets – Mickey Mouse ballet for children (c. 1935), Vesna ballet for children (Spring, 1935), Ruky (Hands; 1957), Korali (Coral Beads; 1960s-1970s), Mavka (Forest Nymph; 1964, 1967), Strakhopud (Scarecrow; 1969, 1976); four operas for children – Tsar Okh (King ‘Oh’, 1930), Sertse Oksany (Oksana’s Heart, 1960), Kuts (The Mountain Imp, 1969-1971), Yarynnyi horodochok (The Little Vegetable Garden, 1969-1971); five choral works – Divine Liturgy (1919), Psalm (c. 1919), Uchitesia, braty moi (Precepts to my brethren, 1930s), Do boiu, do boiu (To Battle, To Battle, 1930s), Triptych (1960, 1970); six chamber works; six piano works; over 20 songs (based on the words of Taras Shevchenko, Vira Vovk, Narcyz Lukianowicz and others); arrangements of Ukrainian Christmas and New Year carols; and other minor works. Stefanie Turkewicz-Lukianowicz’s works are written predominantly in a moderate modernist style, combining traditional tonal music with elements of neoclassicism, neoromanticism, expressionism and, occasionally, serialism. Some of her works were performed in the 1920s-1930s in Lviv and Prague, in 1956-1961 in Western Europe, and in 1969-1970 in Canada. Many of them, however, have yet to be performed, though in recent years some of her songs have been performed in Canada and Ukraine. Recordings of 20 of her songs were published in 2014 in Canada on compact disc (part of the Galicians I – The Art Songs collection).